Are You or a Loved One at Risk for Falling? We Can Help! For older adults, falls are one of the greatest causes of serious health problems, and can result in hip fractures, head injuries or worse. Many people hospitalized for a hip fracture do not return home and are no longer capable of living independently. Our new Biodex Fall Risk Screening & Conditioning Program can identify potential RISK FACTORS in just two minutes. Those identified can be entered into the Conditioning Program to reduce the risk. The Biodex Balance System is an engaging and effective tool that will assess your risk of falling. 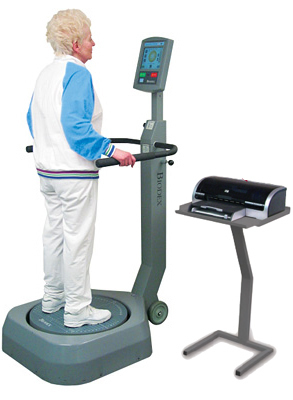 Using a computerized platform, the Biodex system tests your ability to remain upright during environmental instability, and compares your performance against others in your age group. The system is easy to use and results are almost instantaneous. Progressive Physical Therapy will use your individual data to prescribe a unique therapy program. Most patients experience significant results within 6-8 weeks. Postural Stability Training – helps train your body to maintain ideal posture. Maze Control Training – improves your body’s fine motor control skills. Weight Shift Training – helps your body to find and hold its center of gravity. Random Control Training – teaches your body to keep pace with varying levels of movement. Limits of Stability Training – trains your body to maintain its balance. Percentage Weight Bearing Training – determines weight-bearing capabilities using pre-set target zones. Postural Stability Training Emphasize specific movement patterns or strategies by placing markers anywhere on the screen. Score reflects how many times a target is hit. Maze Control Training This defined movement pattern encourages proprioception and motor control. Add or subtract sections to vary the challenge. Weight Shift Training Patients are challenged to shift and control their center of gravity within two parallel lines. Changing the width of the lines controls the degree of difficulty. Score is kept to track progress. Random Control Training An undefined movement pattern where the patient is challenged to keep pace with a moving target. Target size and movement speed can be varied to match skill level. Ideal for motor control and vestibular training. Limits of Stability Training Challenges the patient’s balance within their sway envelope. Progressively increase sway envelope over time. Percentage Weight-Bearing Training Target zones change color when within % weight bearing targets. Don’t let fear of falling slow you down or decrease the quality of your life! Utilizing our innovative Biodex Balance System, we’ll help you determine and reduce your risk of falling and sustaining injuries. If you or someone you care about is at risk of falling, call today for a FREE Fall Risk Screening …before the fall.